Hyatt Corp. got court approval yesterday to buy its flagship Waikiki hotel for $445 million from bankrupt Azabu Buildings Co. Ltd.
U.S. Bankruptcy Judge Robert Faris confirmed the sale of the Hyatt Regency Waikiki Resort & Spa to Hyatt, which has managed the property since it opened in 1974. The sale includes the King's Village Shopping Center, which is owned by Azabu Buildings' wholly owned subsidiary, Azabu USA Corp. Azabu went into bankruptcy in February 2006. Hyatt was the sole qualified bidder, having put down a $25 million deposit for the property as of the March 6 deadline for competing bids. 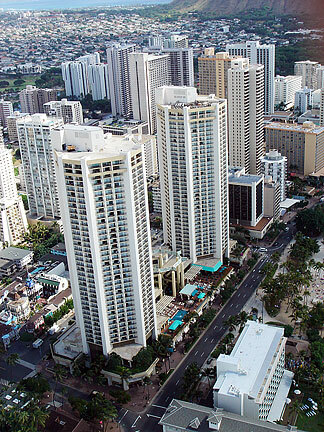 The Hyatt Regency Waikiki Resort & Spa will be sold to Hyatt Corp. for $445 million in a deal that was confirmed yesterday in U.S. Bankruptcy Court. Hyatt, which has managed the flagship property since it opened in 1974, is taking control of the hotel by purchasing the stock of bankrupt Azabu Buildings Co. Ltd. of Japan, which went into bankruptcy in February 2006. The sale includes the King's Village Shopping Center, which is owned by an Azabu subsidiary, Azabu USA Corp. Meanwhile, Azabu and the committee of unsecured creditors have filed a lawsuit against Azabu's Japan-based lender, Chuo Mitsui Trust & Banking Co. Ltd., and entities owned by Honolulu-based Trinity Investments, which holds the first and second mortgages on the hotel totaling $330 million, asserting that the claims should be rejected by the court. A second offer for $5.1 billion in cash or $9 billion in stock from Ade Ogunjobi, founder, chairman and CEO of TC Co./Toks Inc. was rejected by the court, which disqualified his bid because he couldn't post the required $25 million deposit. Toks and Ogunjobi were sued by the U.S. Securities and Exchange Commission in August 2003 for offering fraudulent promissory notes over the Internet in a bid to raise billions of dollars to acquire more than a dozen of the world's largest corporations, though the company had no assets, sales or revenue. In December 2003, Toks, which said it had relocated to Honolulu from Los Angeles, submitted a motion and application to acquire Hawaiian Holdings Inc., parent company of Hawaiian Airlines, through an exchange tender offer for $1 billion in stock and assumption of all of the airline's debt. An auction set for yesterday was called off because there were no other qualified bids. Hyatt is required to increase its deposit to $44.5 million, or 10 percent of the sales price, three business days after confirmation of the transaction. Hyatt is taking control of the hotel by purchasing the stock of Azabu Buildings. Meanwhile, Azabu and the committee of unsecured creditors have filed a suit against Azabu's Japan-based lender Chuo Mitsui Trust & Banking Co. Ltd., Waikiki First Finance Corp. and Waikiki S.F. Corp.
Waikiki First and Waikiki S.F. -- both owned by Honolulu-based Trinity Investments -- hold the first and second mortgages on the hotel, which total $330 million. Azabu and the creditors assert that the lender's claims and the mortgages should either be rejected or reduced in priority. Chuo Mitsui's claims total $192 million. Paul Alston, attorney for Chuo Mitsui and the two mortgage lenders that Trinity acquired, said his clients deny there is any merit to the claims made by Azabu and the creditor's committee. Hyatt's general manager, Michael Jokovich, didn't return calls for comment yesterday. "The property has substantial strategic value to Hyatt so the bid price is fairly aggressive," said tourism consultant Joseph Toy of Hospitality Advisors LLC. "Given its strategic value to Hyatt they certainly are willing to pay that premium."